Next to Santander and its beaches. Excusive farm, nature and beauty! ONE OF THE MOST BEAUTIFUL PRIVATE GARDENS IN THE NORTH OF SPAIN !!! In Cantabria, ten kilometers from Santander, beautiful 80 m2 country house, located on a large private estate of 5,000 square meters considered by landscapers and professionals of gardening as an example of beauty and harmony. For more information, contact us by calling 696264445. Fully integrated into the landscape, its style reminiscent of American architecture of the early twentieth century whose greatest exponent is the famous architect Frank Lloyd Wright. It has all the amenities for a pleasant stay; fireplace in the living room, well equipped kitchen and bright rooms with large windows and beautiful views, and a dream bathroom with jacuzzi and separate shower. Everything is in perfect condition housekeeping. Simple and friendly style, large windows and skylights seamlessly connect the house to the outside, bringing nature into the home. The environment and the building become one thing, and the trees become elements that are in harmony with the interior space in which we live. This is what has been defined as Organic Architecture. THE HOUSE consists of: two bedrooms, a living room with sofa bed for two people, fireplace, television, stereo and beautiful views of the English garden; a bedroom with a double bed, another bedroom with two single beds that can be put together to make a large bed, both with views of the farm. Dressing room, bathroom, TV, DVD and music. LA FINCA, private and reserved for the exclusive use of the traveler, of 5000 square meters, has a wonderful garden with its own native forest, hundreds of trees, more than 60 different varieties, flowers, rocks, fruit trees, a cave, bucolic and intimate corners, barbecue, two atmospheres of outdoor dining room with its tables, garden shower and sun loungers. The entrance to the farm is through a private mall that leads to the parking for several cars and the house. For more information you can call 696264445 and ask Luis López-Dóriga Fragua, the owner. The bathroom, designed, has a great light, as apart from the large window that overlooks the jacuzzi and from which you can see the beautiful garden, has a light on the ceiling that floods the whole. In addition to the hot tub, it is equipped with a large shower. Wood on the ceiling and teak wood on the floor and the jacuzzi ledge create a warm, pleasant and luxurious atmosphere. Gardening service is included and the gardener can get to water and mow when weather conditions warrant, and provided with adequate notice to the tenant. 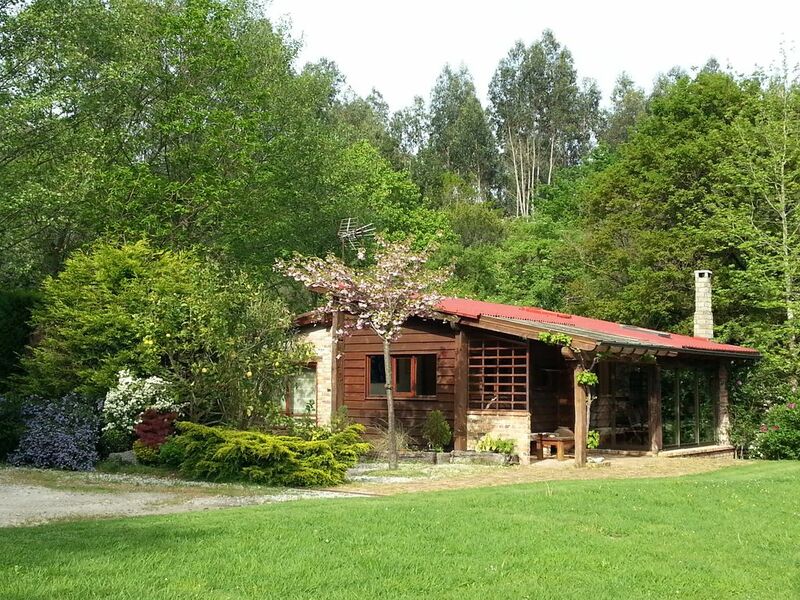 In the middle of nature just 10 km from the city of Santander, Cantabria, and its beaches, the farm is located in a natural redoubt surrounded by native forest and special ecological protection area, just 15 minutes from the beautiful beaches of Liencres, Soto de la Marina and Santander. Being located next to the city of Santander, takes advantage of its area of ​​influence, sharing all its services and advantages (shopping centers, access to highways, airport, rail, port, marina, etc. ), while enjoying the tranquility of the field. There are many possibilities to develop all kinds of sports activities, both sea and mountain (sailing, surfing, golf, hiking, biking, diving, rowing, etc ...), as well as cultural and leisure activities (theater, cinema, exhibitions, the International Festival of Santander, the Menéndez Pelayo International University, the Caves of Altamira, Cueva del Soplao, etc ...). This property has all the advantages of the city and the tranquility and privacy of the field.